Indie Games Explosion is back for Dexcon 15 and this year there have been Â some awesome additions to the convention. Today at 2pm the registration for Dexcon 15 goes Live! Today you can register for the convention and seven newÂ Signature events. Check them out with the links below. If you are interested in running scheduled games, let us know. GMs who put in enough games will receive comped badges. 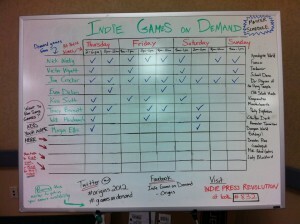 Gen Con 2011 has come and gone, and all we have left of Games on Demand is exhaustion, good memories… and data! This thread is about reporting how the event went this year and gathering feedback from everyone that volunteered and played. Before I get to the numbers, I’d like to say thanks to everyone who came out to join us for games, and to all the volunteers who stepped up to help organize or run games (especially in the evening slots when we had more players than games!). Special thanks to Scott Acker for early planning and negotiations, as well as arranging for the banner (and thanks to Alex Mayo for designing it!). 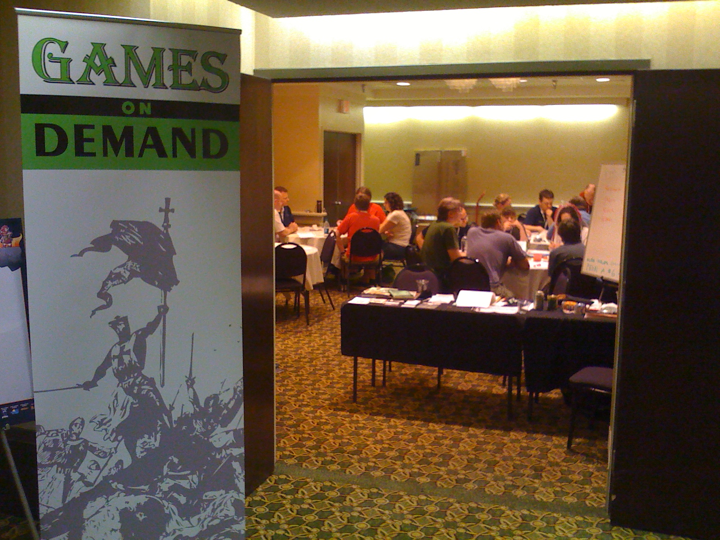 Big Thanks to Indie Press Revolution for sponsoring half a dozen people to be there to organize the event and run games, as well as providing us with extra tables and the white board, which was really essential this year. Thanks to the Gen Con staff for getting us extra tables when we exceeded the bounds of our room. 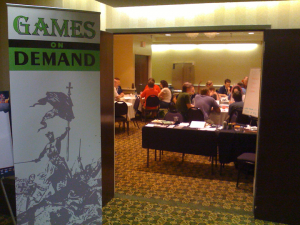 Thanks to all the publishers who provided gaming materials and volunteers to run their games, or who were there themselves hour after hour bringing the fun. Finally thanks to all of you who contributed extra tickets and went out of your way to make sure Games on Demand succeeded this year! Your efforts will make a big difference as we start planning for next year. 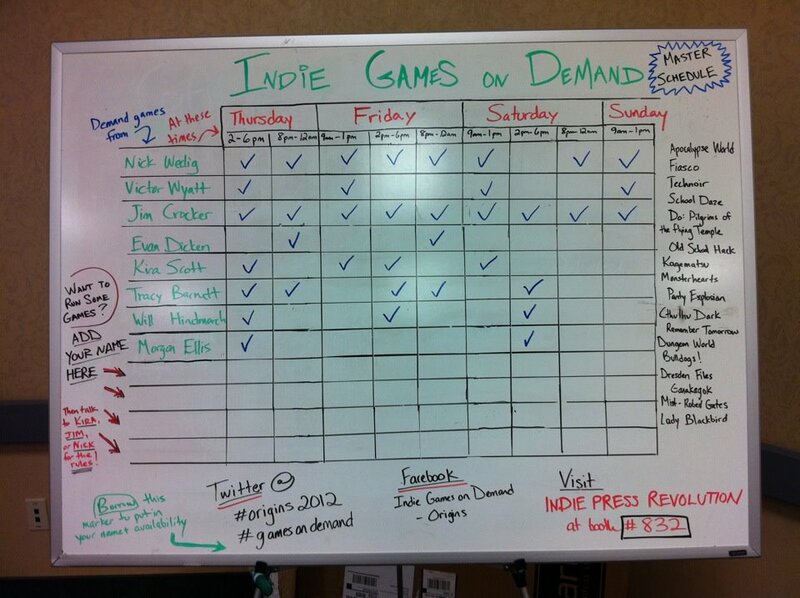 We made a special effort to track what games got played, who ran them, and how many players we had. The following Google spreadsheet shows that information, but there are holes in the data. If you played in a game and remember who ran it or how many players there were, or if your game is missing from this list altogether, please leave a comment or send an email and let me know. We’d love to hear what Games on Demand meant to you this year. Feel free to leave your comments, suggestions, and anecdotes here in the comments. Thanks again for making Gen Con fun!